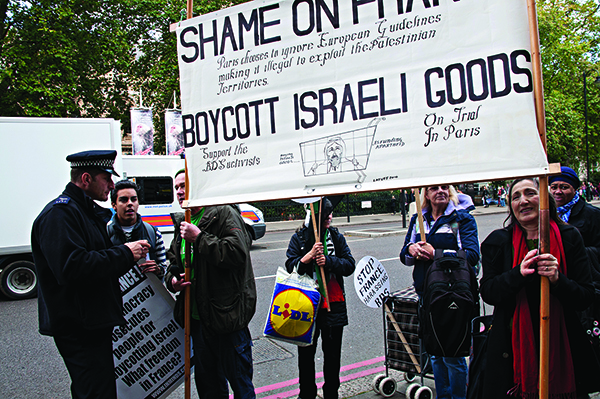 Pro-Palestinian protesters call for a boycott on Israeli goods in central London. The Tory Chief Whip has praised the push to stop “Corbynistas in left-wing town halls” from declaring their own foreign policy in relation to Israel. Mark Harper MP made the comments at the annual parliamentary reception of Conservative Friends of Israel, attended by Israel’s deputy ambassador Eitan Na’eh and Essex MP Priti Patel. The Government has said it will amend pension legislation to make it clear that using pensions and procurement policies to pursue Boycott, Divestment and Sanctions (BDS) campaigns against Israel is inappropriate, and will issue new guidance to implement the same approach in procurement law. Between 2009 and 2014 “at least 20 such motions” were contemplated by local councils, but most boycotts are illegal and therefore highly unlikely to be enforced by councils, of which very trade with Israel anyway. Meanwhile Na’eh praised “a few courageous MPs” who defended Israel in a parliamentary debate in January about child prisoners in the West Bank, while CFI chairman Eric Pickles spoke of “an enormous darkness stalking our country of intolerance against Israel”.